This is the most frequent of all English vowels. It is the easiest sound of the language, since you don't have to do anything to pronounce it. Just relax your mouth, don't move anything, and let a little bit of air out pronouncing an unarticulated sound. But for languages which don't have this sound, relaxing your mouth completely while you speak may be quite difficult, so "practice" is the answer. This sound is so short, so weak and so formless that for some foreigners it may be very difficult to hear. In fact, this sound very often disappears and it is not pronounced at all, especially in British English. For instance, the word POLICE may sound /pəli:s/ or simply /pli:s/. teacher The transcription for this word is /ti:tʃə/, but it sounds similar to /ti:tʃʌ/. This only happens when the schwa goes at the end. 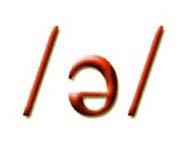 If we make a little pause or we stop talking, then the final schwa may open, but if we continue talking without a pause, then the schwa doesn't open and it still sounds like a very weak sound.